Tonight marks the yohrtzeit of Rebbetzin Chaya Mushkah Schneerson, wife of the Lubavitcher Rebbe. The Rebbetzin passed away on the 22nd of Shevat of the year 5748 (1988). Born in Babinovitch, near the Russian city of Lubavitch on Shabbos, the 25th of Adar I of the year 5661 (March 16, 1901). 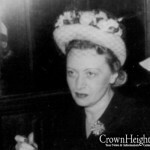 Upon request of her grandfather, Rabbi Sholom Dovber Schneersohn, the fifth Lubavitcher Rebbe, she was named Chaya Mushka after her great grandmother, the wife of the Tzemach Tzedek. She lived in Lubavitch until the autumn of 1915 when due to World War I, she and her family were forced to flee to Rostov. In 1920, on the passing of her grandfather, Rabbi Sholom Dovber Schneersohn, her father Rabbi Yosef Yitzchok Schneerson became the sixth Rebbe of Lubavitch. 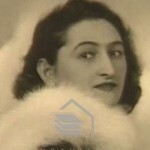 In the spring of 1924, due to increasing dangers for the Jews in Rostov, she and her family moved to Leningrad. In the autumn of 1927 her father was imprisoned for disseminating Torah observance, and she participated in efforts to have him released that were ultimately successful. The Frierdiker Rebbe’s harsh sentence was first commuted to exile, and Chaya Mushka accompanied her father to Kostrama. After his release, the Schneersohn family left the Soviet Union and moved to Riga, Latvia. 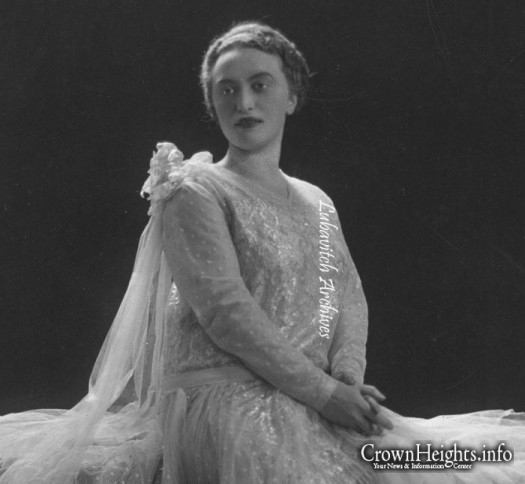 In 1928 she married Rabbi Menachem Mendel Schneerson in Warsaw, and they went to live in Berlin, Germany, where he studied in the local University. After the Nazis came to power in 1933 they fled to Paris, France. When the Nazis invaded France in 1940 they managed to escape from France on the Serpa Pinto, which was the last passenger ship to cross the Atlantic ocean before the U-boat blockade began. 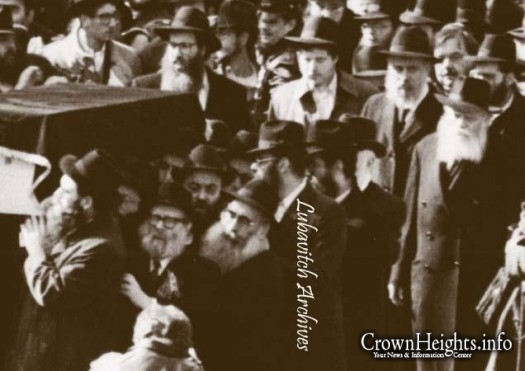 They settled in the Crown Heights section of Brooklyn, New York, where many Lubavitcher Chasidim had already settled. However, her younger sister Shaina Horenstein and her husband, Rabbi Menachem Mendel Horenstein, were trapped in Poland and murdered by the Germans in the gas chambers of Treblinka. In 1950 her father passed away. According to the Chabad biography, teh Rebbe initially did not want to take on the mantle of leadership, but Rebbetzin Chaya Mushka (along with many of her father’s Chasidim) persistently urged him to reconsider, and in 1951 he accepted the Nesius. She saw her role as wholly subordinate to her husband’s mission of Jewish leadership. In public, she always referred to him as “the Rebbe.” When she relayed an answer from him to those seeking his guidance, she always repeated his exact wording and made sure that the listener knew it, invariably refusing either to interpret or elaborate upon his advice. 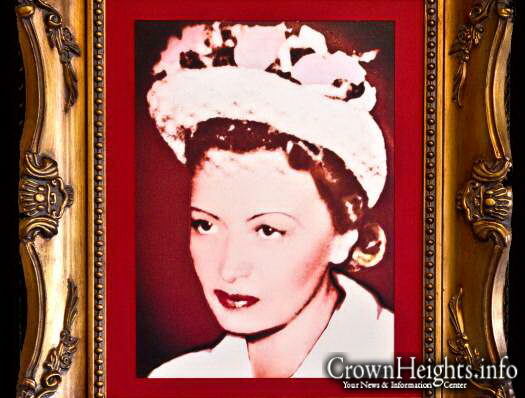 She resisted efforts among the Chassidim to bestow public honors on her. 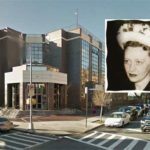 Rabbetzin Chaya Mushka passed away on 22nd of Shevat, 5748, after a brief illness, and was buried in the Old Montefiore Cemetery in Queens, New York, next to her mother, Rebbetzin Nechama Dina, and grandmother, Rebbetzin Shterna Sarah, and near her father. Customary Mishnayos to learn on the date of the Rebbetzins Yohrtzeit. Click Here.